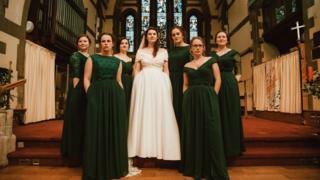 A bride pictured in a hands-in-pockets "power pose" with her six bridesmaids is delighted that the photo has been shared thousands of times on social media. Eve Paterson, 24, had their dresses specially designed with pockets. She said: "Women are both pretty and practical, so why aren't our clothes?" Bridesmaid Nell Goddard tweeted the photo, adding: "Yes, we did use them for storing snacks, thank you for asking." She said they were also used to carry timetables for the day and the wedding breakfast seating plan. The picture has had more than 2,000 retweets and has been liked more than 10,000 times. Mrs Paterson, a charity worker from Cambridge, said: "It's just so rare for women's clothing to be practical. "It might seem ridiculous to most men, but we often have to choose between convenience and looking good." The dress suppliers offered the option of pockets, which Mrs Paterson said made "perfect sense". She also had some fabric from her mother's own wedding dress worked into the pocket lining as "something old" to bring good luck. Bridesmaid Ms Goddard said it was interesting that most people liking or retweeting the picture of the "slightly tongue-in-cheek power pose" were women. "Pockets on bridal and bridesmaids dresses are virtually unheard of, but incredibly useful when you think about it," she said. "I've had loads of replies to the tweet with people tagging their friends who are getting married, or saying they wish they'd had this for their wedding." Mrs Paterson and her groom Angus married at Woodford Green, London, on 8 December. Photographer Toby Mitchell said: "I thought it would be funny to do an epic cover shot vibe or power stance with everyone's hands in their pockets. "Clearly pockets in your wedding attire is something awesome these days."